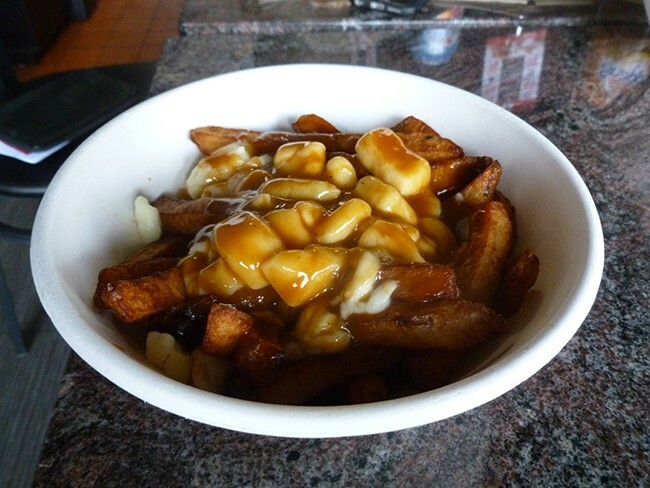 When I lived in Buffalo, New York and frequented Toronto, poutine was the go-to dish for soaking up alcohol after nights of spirited bar hopping. Available only in Canada at the time, it was usually slung from casual diners and walk-up windows. 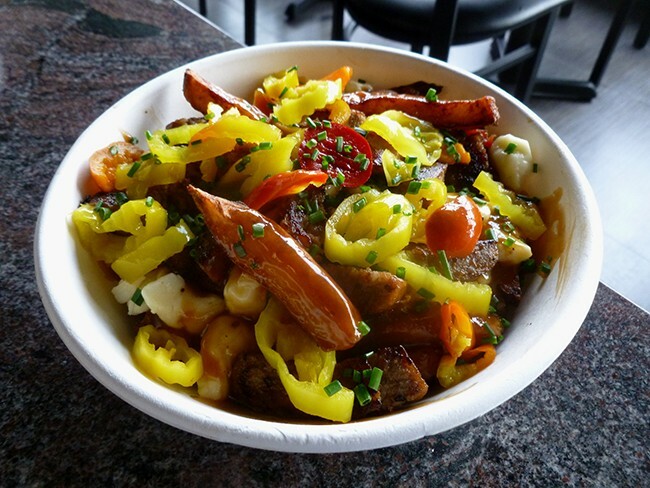 Poutine has since leapt beyond the confines of greasy-spoon eateries and into mainstream restaurants, spreading throughout the U.S. with versions that don’t always pass muster with flag-waving Canadians. 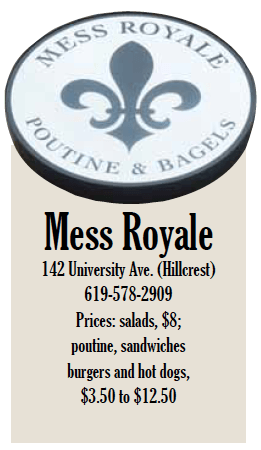 Although at Mess Royale, which opened in Hillcrest last month, Montreal transplant Hugo Tassone gives us a taste of the real deal by adhering to the exact standards for making it. He’s also incorporated into the menu sandwiches using hand-stretched bagels shipped in from Montreal’s eminent St-Viateur Bagel shop. And for those who think that Chicago is the only North American city that puts a signature stamp on hot dogs, Tassone exposes us to the wildly delicious “toasty dogs” served on grilled, buttered rollseHe that became concession-stand trademarks at the Montreal Forum during hockey games. 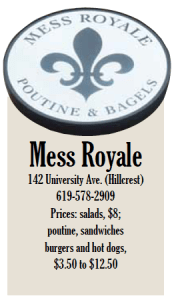 For the poutine, Mess Royale uses hand-cut fries that are double-fried. The gravy comprises a secret blend of spices and meat stocks. It’s thin and somewhat salty – not much different from American brown gravy except for its subtle, caramelized flavor detected by the keenest of palates. Cheese curds are the critical ingredient, providing the soft, buttery joy spots strewn throughout the dish. 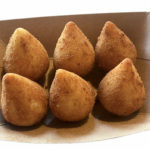 Tassone searched high and low for them in the U.S. before finding a Wisconsin dairy farm that produces the curds with the exact same flavor and texture as those used in Quebec. 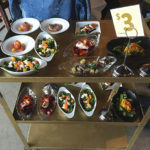 “It’s a young cheese that has to feel a little squeaky between your teeth,” he says, adding that he goes through nearly 200 pounds of the curds every week. The “Tony,” for example, kept us equally engaged. It’s crowned with sweet Italian sausage and zingy banana peppers, which so many San Diego kitchens sadly overlook in lieu of jalapenos. They’re simply not the same thing. 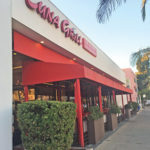 If you prefer carne asada, pastrami or chicken and mushrooms in the mix, the menu obliges with several other modern varieties, including the “morning recovery” featuring bacon, sausage and a fried egg. As one of the few people in the world who isn’t nuts about bagels, the sesame-studded ones used here were a revelation because they’re sweeter and airier than most. Arriving twice a week in refrigerated containers, the Montreal bakery dips them in honey water before cooking them in a wood-fired oven. We chose a bagel sandwich containing gently smoked Norwegian salmon, garnished generously with cream cheese, capers, red onions and tomatoes – a winner all the way around. 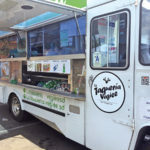 Other sandwich choices include avocado with cream cheese and veggies; pastrami and Swiss; and roasted turkey with bacon, Jack cheese and chipotle mayo. The “toasty dogs” are a must, and they’re free on Tuesdays with the purchase of any poutine. 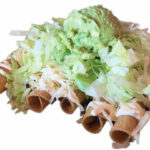 Tucked into an unconventional roll that’s buttered and grilled on the outside, the dog is buried under a juicy mantle of marinated coleslaw, sweet relish, onions and mustard. 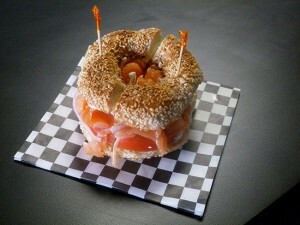 Had we not been floating in poutine-bagel heaven, we could have eaten a dozen of them. Raves have been given to Mess Royale’s grilled cheese sandwiches on country-style bread, which we didn’t get around to trying. But we managed to squeeze in the “candied bacon bites” featuring thick squares of skewered bacon glistening in beer-maple glaze. Just when you thought trendy bacon recipes have reached their end, these little dandies come to the rescue. Mess Royale greets with a bright, casual atmosphere featuring a giant rendition of the California flag altered by a bowl of poutine sitting beneath the bear’s muzzle, and with the words: “Poutine Republic” written below. 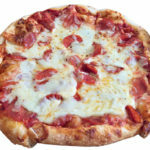 Indeed, Tassone’s wish of “bringing something unique to San Diego” means we could now add “Canadian” into our ethnic dining options.